Ford’s Territory SUV made waves in 2004 by being the very first suburban 4×4 designed exclusively for Australians’ needs. The vehicle sits at a perfect size and price point between larger vehicles like the Toyota Prado and sporty, but not necessarily cargo-friendly, sedans. When introduced, the market went wild and made the Territory the first Australian-built SUV to lead the sales in its category. The first model of Territory even captured the coveted Car of the Year Award from Wheels magazine in 2004. Today, families still get just as much use out of the Territory as ever. Versatile features, an appealing choice of engines and competitive pricing help push the Territory to the front row of its segment and make it the perfect choice for navigating the suburban jungle. A large choice of powertrains allows families to customise Territory performance to their needs. A 4.0L petrol pushes out a hefty 195 kW/391 Nm to the rear wheels, and a torquier 2.7L V6 turbodiesel generates 140kW/440Nm in both AWD and RWD configurations. Both give respectable fuel economy at 8.2-11.6 L/100kms with the petrol being the slightly thirstier option. These engines are a joy to drive thanks to the sophisticated and fun car-tuned suspension. Stability control keeps all of the tyres on the road, even in a potential rollover situation. You also have hill assist to add subtle braking power when moving down those steeper descents. All of these benefits come with a soft ride and next to no road noise thanks to the well-insulated cabin. While many suburbanites appreciate a fun vehicle, they may not be in it for the punch. Luckily, the Territory satisfies even the most practical-minded with tons of great features that add versatility and functionality to the car. 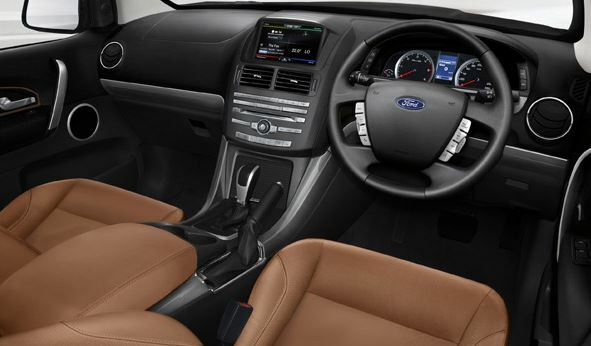 Ford designer Marcus Hotblack was inspired by a Swiss army knife when conceiving the Territory’s interior. He added features like flexible cup holders, handbag compartments and a folding third row stadium-style seat that makes spying on littlies in the back row simple to do during a drive. The newest version includes no less than 30 storage compartments, including a rear rubbish bin for messy kids and a lockable security drawer hidden under the driver’s seat. Other, ‘smarter’ features include USB ports for charging and syncing music from smartphones. 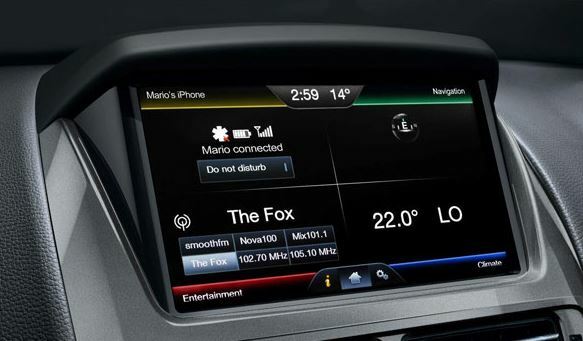 A revamped Sync 2 infotainment system makes navigating through the functions you need easy and intuitive. Upgrading to the Titanium version affords special 18 inch alloy wheels, LED daytime running lights, an auto-dimming rearview mirror, navigation, an Alpine rear DVD entertainment system, tinted rear privacy glass and handsome leather seat trim. Altogether, the Ford Territory is an excellent option for busy families that need comfort and sportiness in addition to their heavy hauling needs. 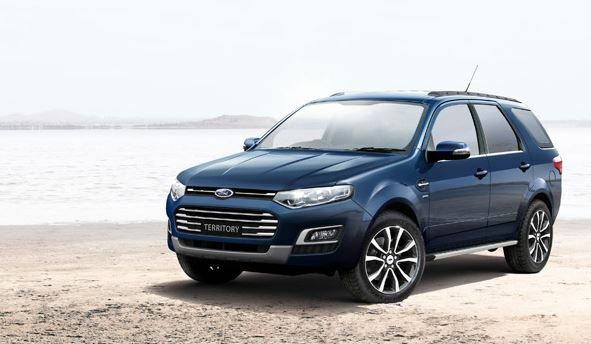 Visit our new car page to locate the perfect Ford Territory model for you, then come in and give it a spin to see why so many Australians love it.